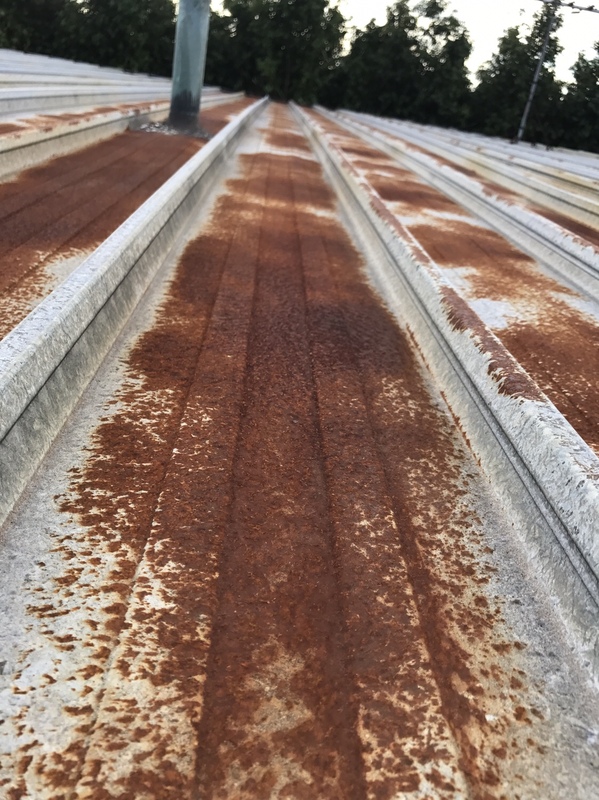 When working on the metal roof, gutters and downpipes of your home, care has to be taken to prevent early corrosion of materials which can lead to internal damage to your home from roof leaks. All metal roofs will breakdown eventually. When exposed to the elements, the steel along with rain and oxygen will eventually result in a rusted out roof. However, with the average life expectancy of a metal roof being 70 years, there are a few key measures that must be factored in when installing a new roof or maintaining an existing roof to maximise its life. Accelerated corrosion can occur when gutters are installed incorrectly with insufficient fall for the water to run away. This results in water pooling. 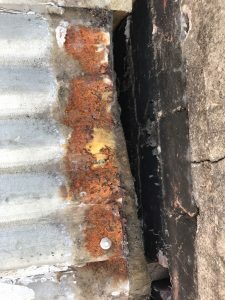 If the metal gutter is constantly exposed to water pooling the steel will eventually rust and holes will form where the water pool was allowing water to filter through below. Your licensed roof plumber should allow adequate fall on all your gutters to allow the water to run freely through the gutters and away from your house. Accelerated corrosion can also occur by electrolysis when non compatible materials mix. This is a phenomenon also known as galvanic corrosion. And it is because of this that care must be taken to ensure the correct materials are used. For example lead and copper should not come into contact with a Zincalume or Colorbond roof, and any water run off from copper or lead pipes should be avoided aswell. There are no issues with zinc in combination with metals other than copper and mild steel. When zinc contacts copper in the presence of an electrolyte (such as water) a galvanic reaction will lead to corrosion of the zinc and subsequent failure of the roof or wall cladding. Run-off from a copper surface to a zinc surface must be avoided under all circumstances. Zinc in contact with mild (carbon) steel is not desirable, either, due to similar electron transfers between the metal that will result in zinc corrosion and deterioration. In general, water should not be allowed to run from a higher potential metal to a metal with a lower one. All metals should be installed in the following order (from top to bottom). 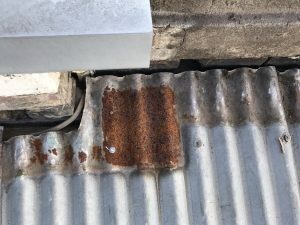 We recently attended a job where a lead flashing was installed on top of a zinc corrugated iron roof. As you can see from the pictures below, this has resulted in the accelerated corrosion of the zincalume roof where the led flashing was. This resulted in a roof replacement for the owners of the house in order to fix the roof leak and remove all the rusted out materials. We provide a wide range of roofing services to Geelong and surrounds to protect your home or building from damage. So if you have a problem with your metal roof, call and ask a licensed Roof Plumber about it today! If you would like more information regarding our roof plumbing services, please don’t hesitate to contact us. We are always happy to discuss your individual needs and provide options to fix your roof leak, do roof repairs or roof maintenance.